According to a well-known journalist, Rangers have formally tabled a £4M bid for Swansea’s Oliver Mcburnie. Now, whether this is the same £4M bid we were reported to have submitted over a week ago is another question, but nevertheless whether it was last week or within the past few days, it does now seem that Steven Gerrard is deadly serious about bringing the 21-year old forward to Govan as his first marquee transfer as Rangers manager. 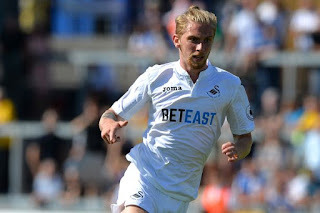 For his part, we know only too well McBurnie is a dyed-in-the-wool bluenose who has bigged up the idea of leaving Wales, with a non-too-subtle congratulations at his close friend Allan McGregor who clinched the same move recently, as well as admitting he may see his future outwith Swansea. The attacker had a fine time in the Championship on loan with Barnsley last season, and his stock is pretty prime at present as a result, so this is one Gerrard and Mark Allen would want to get over the line as quickly as is feasible. McBurnie is all about potential and along with Liverpool’s Harry Wilson, these are two promising young Brits Gerrard is keen to get among Rangers’ ranks as soon as possible. He better make friends in Glasgow, Hell of a journey down to Nottingham for a pint methinks!! If true I hope SG has got this one right. £4m seems like a lot for an unproven youngster who scored a few goals for Barnsley. If he was any good surely he would've made it into a relegated Swansea team? It's a gamble and maybe one worth taking if you have £30m to spend which I doubt we have. And let's put aside this nonsense that he's a bluenose. So what? A great signing if it happens,what I have more of an issue with 8s the alleged interest in Harry Wilson. I believe he is a wide left me/ winger of some potential. We have just signed Murphy for £1.6m and have in Greg Middleton another player in the same mound. Indeed the lad Middleton is being lauded as one of the f8nest Scottish prospects in years with many suggesting he should be elevated next season towards the first team. Why would we want now three players for that one position? I would respectfully suggest we should be focusing on CBS as a priority and a genuine No 10. That is our areas with the most weakness. Wilson & Middleton can play on both wings and the Nr-10 if need be. Agree with Robbie. Sometimes we just need something a bit different to open up tight defences after 70mins. Now they are in the Championship McBurnie would get regular game time at Swansea. Stay there ,son. Why do you want him to stay at swansea? Good talent, broke through as an internationalist and played well. Watch him loose that place in the squad if he moves. Who is the manager Gerrard or Allen ? Gerrard must be allowed to sign his own players not told who to sign,we need better than mcburnie to win the league.